Medicare Advantage (MA) plans that serve relatively higher proportions of dually enrolled beneficiaries have lower ratings in the MA Star Rating program than plans that serve fewer dually enrolled beneficiaries. However, some MA plans that serve a high proportion of dually enrolled beneficiaries are high performers. Their high performance may be the result of successful strategies they have implemented to meet the complex health and social needs of their members. 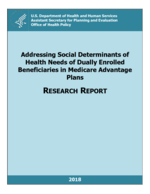 The goals of this research, conducted in two phases, were to (1) characterize the needs of dually enrolled beneficiaries and the degree to which their needs overlap with other high-cost, high-need individuals more broadly; (2) identify the additional services that health plans provide to dually enrolled beneficiaries or other high-cost, high-need beneficiaries; (3) identify the range of added costs and resources needed to deliver these services and determine whether health plans found these services to be of value; and (4) assess the available evidence on whether such services were associated with better quality and outcomes. To address these goals, the first phase of this project included an environmental scan and key informant interviews. The second phase of the study—which focused on identifying additional information via key informant interviews with seven organizations and four in-depth case studies with high-performing MA plans serving a large proportion of dually enrolled beneficiaries—is presented in this report. We found that a range of high-performing MA plans serving a large proportion of dually enrolled beneficiaries implement multipronged approaches to address the needs of their complex member populations. Plans are trying to engage and address patients’ social needs in a systematic, comprehensive manner. The four case studies (HealthPartners, Minnesota; SCAN Health Plan, California; UPMC for You, Pennsylvania; Commonwealth Care Alliance®, Massachusetts) offer examples of the extent to which committed, high-performing MA plans engage in efforts to address the social and health needs of this vulnerable population and improve their health outcomes. Reported outcomes associated with these strategies included reductions of 20 to 33 percent in emergency department (ED) visits and hospitalizations through various pilots testing a care management program, an integrated care team approach, and a medically tailored meal-delivery program, as well as reductions in unplanned utilization estimated to result in a net savings of up to $500 per participant through a pilot housing stability program. a. Use patient-centered performance measures and instruments that are relevant for dually enrolled beneficiaries for payment and public reporting programs. 2. Set high and fair quality standards. a. Account for clinical complexity and social risk in performance measures by stratifying, adjusting, or otherwise accounting for clinical complexity and social needs of dually enrolled beneficiaries. 3. Reward and support better outcomes. a. Align incentives for care interventions by building an evidence base through promoting rigorous evaluations to identify effective interventions, sharing best practices, and designing value-based purchasing programs that are sensitive to and reward the addressing of SDOH. b. Build a supportive environment by supporting community resources and links at a local level and implementing supportive state and federal policies.